What is hawthorn? What is it used for? Hawthorn belongs to the same botanical family as the rose. An extremely common thorny shrub, it can reach a height of five feet and grows on hillsides and sunny wooded areas across the world. Hawthorn shrubs contain shiny leaves that grow in a variety of shapes and sizes. Its flowers (white, red or pink) grow in small clusters, followed by small red or black berries that usually appear in the spring. The leaves, berries and flowers are used medicinally. These items contain bioflavonoids, which have a variety of cardiovascular benefits, including a reduction in hypertension, increased coronary artery blood flow and improved contraction of the heart muscle. Large scale clinical trials have confirmed that hawthorn is effective in treating patients with earl-stage and mild congestive heart failure. Other smaller studies have shown that it may help patients with angina and abnormal heart rhythms. How much hawthorn should I take? 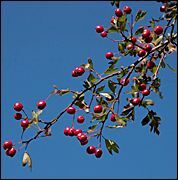 Many herbalists recommend taking 80-300mg of a hawthorn extract, either in capsule or tablet form, two to three times a day. If traditional preparations are used, patients are recommended to take 4-5 grams per day, or 4-5ml of a hawthorn tincture three times daily. When using hawthorn, make sure to take only standardized hawthorn products. Look for a label that says the product contains between 4-20mg of flavonoids and 30-160mg oligomeric procyanidins, or 1.8% vitexin rhamnoside/10% procyanidins. What forms of hawthorn are available? Hawthorn comes in a variety of forms, including capsules, tinctures, and fluid or solid extracts. Patients can also make a hawthorn tea by combining dried cut hawthorn leaves, flowers and berries in boiling water. What can happen if I take too much hawthorn? Are there any interactions I should be aware of? What precautions should I take? Hawthorn is extremely safe. The American Herbal Products Association has given hawthorn a class I rating, meaning it is a safe herb with a wide dosage range. Nevertheless, it is always wise to follow the recommended dosage. In addition, patients who are pregnant or lactating should not take hawthorn. Some studies have suggested that hawthorn may enhance the effects of digitalis, a heart medication. People taking cardiac medications should consult with their health care provider before taking hawthorn or hawthorn-containing products. Bahourn T, Gressier B, Trotin F, et al. Oxygen species scavenging activity of phenolic extracts from hawthorn fresh plant organs and pharmaceutical preparations. Arzneimittelforschung 1996;46:1086-1089. Hoffmann D. Hawthorn: the heart helper. Alternative & Complementary Therapies 1995;4:191-192. Kowalchik C, Hylton W (eds.) Rodales Illustrated Encyclopedia of Herbs. Emmaus, PA: Rodale Press, 1998. Tauchert M, Ploch M, Hubner WD. Effectiveness of hawthorn extract LI 132 compared with the ACE inhibitor captopril: multicenter double-blind study with 132 NYHA stage II. Muench Med Wochenschr 1994;136:S27-S33. Weiss RF. Herbal Medicine. Beaconsfield, England: Beaconsfield Publishers, 1988, pp. 162-169.